1School of Industrial Engineering, College of Engineering, University of Tehran, Tehran, Iran. 2School of Industrial Engineering, Iran University of Science &amp;amp; Technology. This study considers a reliable location – inventory problem for a supply chain system comprising one supplier, multiple distribution centers (DCs), and multiple retailers in which we determine DCs location, inventory replenishment decisions and assignment retailers to DCs, simultaneously. Each DC is managed through a continuous review (S, Q) inventory policy. For tackling real world conditions, we consider the risk of probabilistic distribution center disruptions, and also uncertain demand and lead times, which follow Poisson and Exponential distributions, respectively. A new mathematical formulation is proposed and we model the proposed problem in two steps, in the first step, a queuing system is applied to calculate mean inventory and mean reorder rate of steady-state condition for each DC. Next, regarding the results obtained from the first step, we formulate a mixed integer nonlinear programming model which minimizes the total expected cost of inventory, location and transportation and can be solved efficiently by means of LINGO software. Finally, several test problems and sensitivity analysis of key parameters are conducted in order to illustrate the effectiveness of the proposed model. Asl-Najafi, J., Zahiri, B., Bozorgi-Amiri, A., and Taheri-Moghadam, A., (2015). "A dynamic closed-loop location-inventory problem under disruption risk", Computers & Industrial Engineering, Vol. 90, pp. 414-428. Baumol, W. J., and Wolfe, P., (1958). "A warehouse-location problem", Operations Research, Vol. 6, No. 2, pp. 252-263. Chen, Q., Li, X., and Ouyang, Y., (2011). "Joint inventory-location problem under the risk of probabilistic facility disruptions", Transportation Research Part B: Methodological, Vol. 45, No. 7, pp. 991-1003. Daskin, M. S., Coullard, C. R., and Shen, Z.-J. M., (2002). "An inventory-location model: Formulation, solution algorithm and computational results", Annals of operations research, Vol. 110, No. 1, pp. 83-106. Diabat, A., Abdallah, T., and Henschel, A., (2015). "A closed-loop location-inventory problem with spare parts consideration", Computers & Operations Research, Vol. 54, pp. 245-256. Farahani, M., Shavandi, H., and Rahmani, D., (2017). 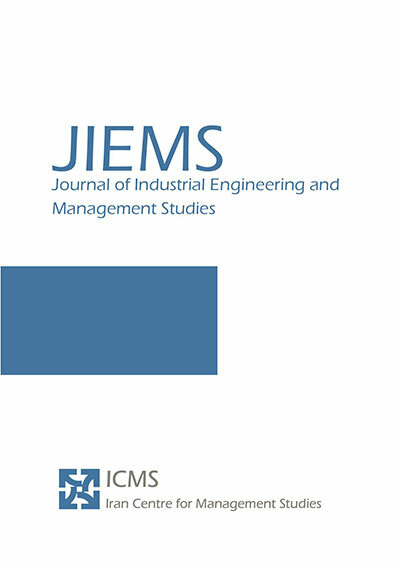 "A location-inventory model considering a strategy to mitigate disruption risk in supply chain by substitutable products", Computers & Industrial Engineering, Vol. 108, pp. 213-224. Fontalvo, M. O., Maza, V. C., and Miranda, P., (2017). "A Meta-Heuristic Approach to a Strategic Mixed Inventory-Location Model: Formulation and Application", Transportation Research Procedia, Vol. 25, pp. 729-746. Ghafour, K., Ramli, R., and Zaibidi, N. Z., (2017). "Developing a M/G/C-FCFS queueing model with continuous review (R, Q) inventory system policy in a cement industry", Journal of Intelligent & Fuzzy Systems, Vol. 32, No. 6, pp. 4059-4068. Gzara, F., Nematollahi, E., and Dasci, A., (2014). "Linear location-inventory models for service parts logistics network design", Computers & Industrial Engineering, Vol. 69, pp. 53-63. Isotupa, K. S., (2006). "An (s, Q) Markovian inventory system with lost sales and two demand classes", Mathematical and computer modelling, Vol. 43, No. 7, pp. 687-694. Isotupa, K. S., and Samanta, S., (2013). "A continuous review (s, Q) inventory system with priority customers and arbitrarily distributed lead times", Mathematical and computer modelling, Vol. 57, No. 5, pp. 1259-1269. Javid, A. A., and Azad, N., (2010). "Incorporating location, routing and inventory decisions in supply chain network design", Transportation Research Part E: Logistics and Transportation Review, Vol. 46, No. 5, pp. 582-597. Kim, E., (2005). "Optimal inventory replenishment policy for a queueing system with finite waiting room capacity", European journal of operational research, Vol. 161, No. 1, pp. 256-274. Krishnamoorthy, A., Shajin, D., & Lakshmy, B., (2016). "On a queueing-inventory with reservation, cancellation, common life time and retrial". Annals of operations research, Vol. 247, No. 1, pp. 365-389. Liao, S.-H., Hsieh, C.-L., and Lai, P.-J., (2011). "An evolutionary approach for multi-objective optimization of the integrated location–inventory distribution network problem in vendor-managed inventory". Expert Systems with Applications, Vol. 38, No. 6, pp. 6768-6776. Lin, J.-R., Yang, T.-H., and Chang, Y.-C., (2013). "A hub location inventory model for bicycle sharing system design: Formulation and solution", Computers & Industrial Engineering, Vol. 65, No. 1, pp. 77-86. Liu, L., Liu, X., and Yao, D. D., (2004). "Analysis and optimization of a multistage inventory-queue system". Management Science, Vol. 50, No. 3, pp. 365-380. Macchion, L., Danese, P., and Vinelli, A., (2015). "Redefining supply network strategies to face changing environments. A study from the fashion and luxury industry", Operations management research, Vol. 8, pp. 15-31. Melikov, A., and Shahmaliyev, M., (2017). "Analysis of Perishable Queueing-Inventory System with Positive Service Time and (S-1, S) Replenishment Policy", Paper presented at the International Conference on Information Technologies and Mathematical Modelling. Miranda, P. A., and Garrido, R. A., (2004). "Incorporating inventory control decisions into a strategic distribution network design model with stochastic demand", Transportation Research Part E: Logistics and Transportation Review, Vol. 40, No. 3, pp. 183-207. Miranda, P. A., and Garrido, R. A., (2008). "Valid inequalities for Lagrangian relaxation in an inventory location problem with stochastic capacity", Transportation Research Part E: Logistics and Transportation Review, Vol. 44, No. 1, pp. 47-65. Qu, H., Wang, L., and Liu, R., (2015). "A contrastive study of the stochastic location-inventory problem with joint replenishment and independent replenishment", Expert Systems with Applications, Vol. 42, No. 4, pp. 2061-2072. Ramezani, M., (2014). "A quoining-location model for in multi-product supply chain with lead time under uncertainty". Sadjadi, S. J., Makui, A., Dehghani, E., and Pour Mohammad, M., (2016). "Applying queuing approach for a stochastic location-inventory problem with two different mean inventory considerations", Applied Mathematical Modelling, Vol. 40, No. 1, pp. 578-596. Saffari, M., and Haji, R., (2009). "Queueing system with inventory for two-echelon supply chain", Paper presented at the Computers & Industrial Engineering, 2009. CIE 2009. International Conference. Schwarz, M., and Daduna, H., (2006). "Queueing systems with inventory management with random lead times and with backordering", Mathematical Methods of Operations Research, Vol. 64, No. 3, pp. 383-414. Shen, Z.-J. M., Coullard, C., and Daskin, M. S., (2003). "A joint location-inventory model", Transportation science, Vol. 37, No. 1, pp. 40-55. Sigman, K., and Simchi-Levi, D., (1992). "Light traffic heuristic for anM/G/1 queue with limited inventory", Annals of operations research, Vol. 40, No. 1, pp. 371-380. Chemicals Company", Journal of Manufacturing Systems, Vol. 29, No. 2, pp. 55-62. Zeng, J., Phan, C. A., and Matsui, Y., (2013). "Supply chain quality management practices and performance: An empirical study", Operations management research, Vol. 6, pp. 19-31. Zhang, Z.-H., and Unnikrishnan, A., (2016). "A coordinated location-inventory problem in closed-loop supply chain". Transportation Research Part B: Methodological, Vol. 89, pp. 127-148. Zhao, N., and Lian, Z., (2011). "A queueing-inventory system with two classes of customers", International Journal of Production Economics, Vol. 129, No. 1, pp. 225-231.